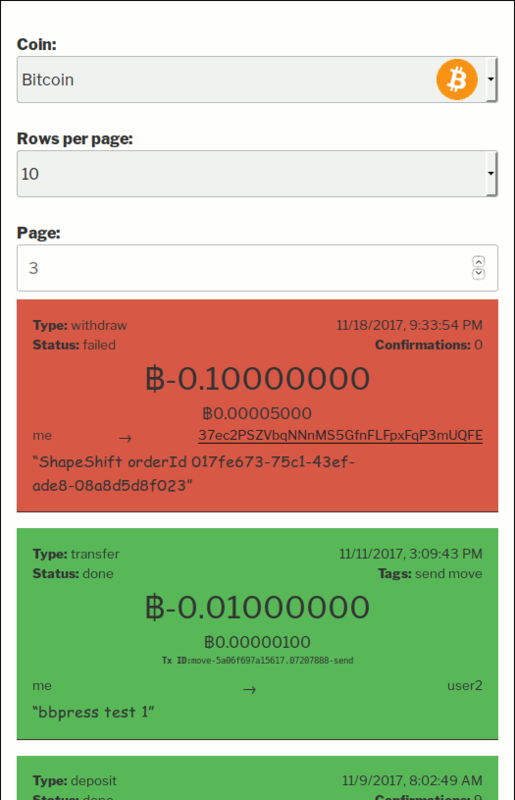 Wallet shortcodes display forms to the front-end that let the users access their cryptocurrency accounts. there is at least one coin adapter online. Note: The same set of UI elements is also available as widgets to be inserted in your theme’s widget area. Navigate to Appearance → Widgets to configure, or set via the Customizer. 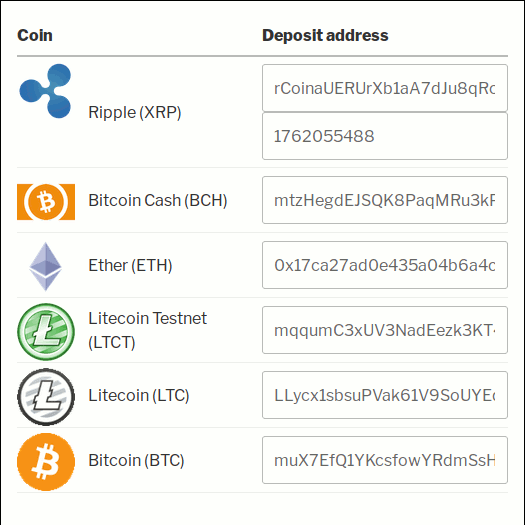 Use the [wallets_deposit] shortcode to display a UI that will let the user know which address they can send coins to if they wish to make a deposit. As of version 3.6.2, this UI accepts an optional qrsize argument. If set to an integer, determines the size (width and height) of the deposit QR code, in pixels. If the argument is left empty, no explicit size is set. The qrsize argument is also available when the UI is used as a Widget. 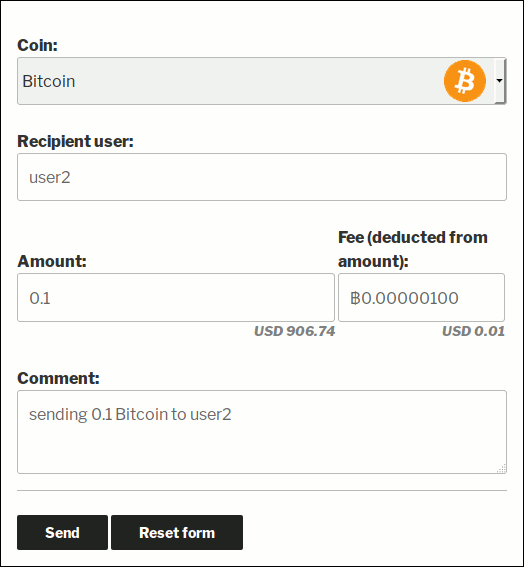 To render a deposit UI statically for Bitcoin, use [wallets_deposit template="static" symbol="BTC"]. The UI will not require the JSON API and will not refresh. The user will not be able to renew their deposit address. Use the [wallets_withdraw] shortcode to display a form that will let the user withdraw funds. The user will be notified by email when the withdrawal succeeds. 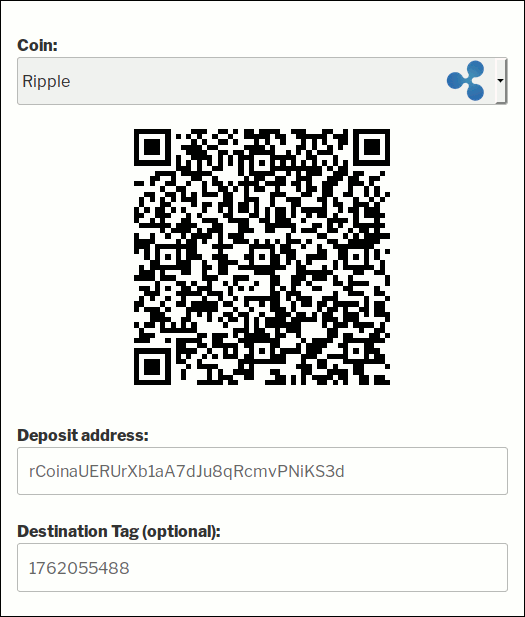 Use the [wallets_move] shortcode to display a form that lets the user transfer coins to other users on your site. Both users will be notified by email when the transaction succeeds. Use the [wallets_balance] shortcode to show the current user’s balances. Use [wallets_balance template="list"] to show all the current user’s balances in a list. To render static HTML with the BTC balance of user with ID 2. 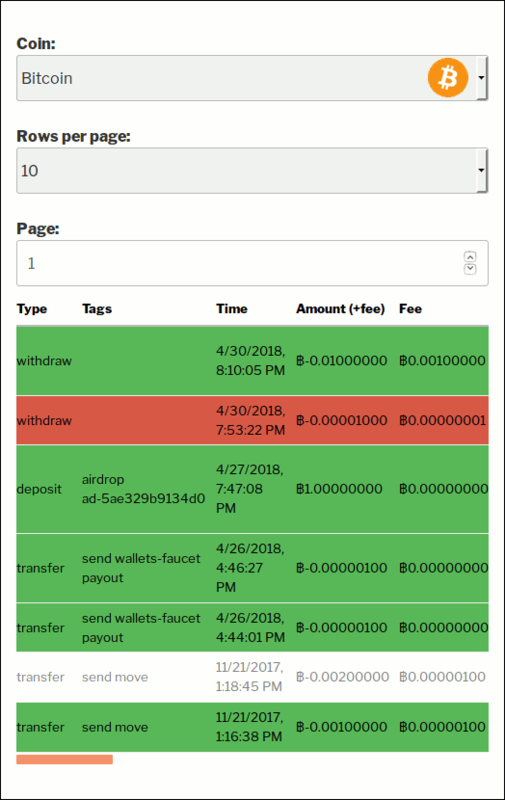 Use the [wallets_transactions] shortcode to display an interactive table that shows past deposits, withdrawals and transfers that affect the user’s account. The table is paginated and data is loaded dynamically. This template does not require the JSON API and does not refresh. It requires the symbol argument. A comma-separated list of any of the following: deposit, withdraw, move, trade. A comma-separated list of tags to look for in transactions. Transactions with any one of the specified tags are listed. Use the [wallets_account_value] shortcode to show the account’s total value expressed in the default fiat currency. Introduced in version 3.1.3. This requires that you have first set up an API key for the fixer service. See the Exchange Rates section of the documentation for details. To render the UI statically use [wallets_account_value tempate="static"]. The view will not require the JSON API and will not refresh. Use the [wallets_rates] shortcode to show the exchange rates between each coin and the default fiat currency. 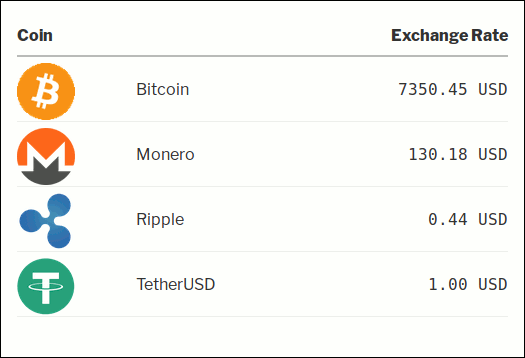 Only currencies whose exchange rate is known will be listed. The UI will not show, if the user set their default fiat currency to “none”. This can be done in the user profile admin screen. To control the number of decimal digits to display exchange rates in, use the optional “decimals” attribute (introduced in version 4.0.4). For example: [wallets_rates decimals=2]. To render the same UI with static HTML, use [wallets_rates template="static"]. The UI will not require the JSON API and will not refresh. 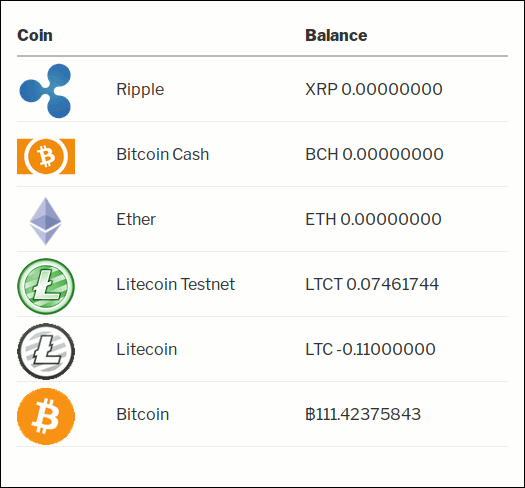 Use the [wallets_total_balances] shortcode to show the total user balances for each coin. Introduced in 3.6.0. Unlike other UIs, this one is static by default. It is rendered as an HTML when the page loads, and it is not updated with the live polling mechanism (and does not use the JSON API). The default behavior is to display informative message boxes using the browser’s alert() function. You can bind handlers to these DOM events to override, or to add to, this behavior. The above examples override the default handlers. If you wish to add to the default behavior, simply delete the event.preventDefault() statements and let the events bubble up. If you are a developer, you can override the default forms provided to do much more than just change the styling. All the UI elements are implemented as knockout.js forms that talk to the provided JSON API. Visit the download area to get this plugin! Make sure to download the bundle to get the documentation too! Updated on 2019-02-22T18:06:38+00:00, by alexg.